Venomous (poisonous)* snakes can be worrisome anywhere, but especially in a yard. The good news is that research shows that native venomous species in the U.S. prefer not to bite and aren’t aggressive unless provoked. And, when they do bite a human, their venom rarely kills. With watchfulness when outdoors, one can live around them with relative safety — lots of people do. But the best way to coexist is to keep them at a distance. Here are tips on how to do that. Snakes don’t like to be seen. So, if venomous species live in your area, the best way to discourage them is to keep your yard trim and tidy. This means no messy areas: Keep grasses mowed short and shrubs trimmed up, especially around your house. Also, remove the attractions mentioned above, or move them to different, safer locations. You may be wondering if that doesn’t defeat the purpose of creating a wildlife habitat. Well, yes and no. It does mean you need to plant your wildlife areas away from your house and the parts of the yard you use for playing and entertaining. But you can still have wildlife habitat, just put it farther away, like along the perimeter or in corners. One homeowner has reported to us that she lives in a rural Florida area that’s heavily wooded and has thick undergrowth that harbors venomous snakes. She keeps her yard cleared except for the perimeter, where she can enjoy watching wildlife with safety. She rarely sees a snake, but when she does they’re always just barely visible in the undergrowth, only their movements catching her attention. If she approaches, the snake disappears. In her 23 years there, she’s never seen one come into the open, where it would be fully exposed. In the U.S., nonvenomous snakes outnumber venomous ones in both number of species and number of individuals. There are about 20 species of venomous snakes in the U.S., those being rattlesnakes, cottonmouths, copperheads, the rarely found Coral Snake, and their subspecies. Every state but Alaska and Hawaii is home to at least one venomous species. The highest concentrations are in warm states. U.S. snake species aren’t aggressive toward humans. They won’t approach a human; the human must approach the snake. If you encounter a snake, venomous or not, just slowly back away. What you don’t want to do is inadvertently corner a snake, leaving it no choice but to strike. Snakes can spring forward about half their body length, so a 4-foot snake can spring 2 feet toward you (sometimes more). According to the U.S. Centers for Disease Control and Prevention, about 7,000 to 10,000 people are bitten by venomous snakes each year in the U.S. and 10 to 15 die. Although some bites occur when a snake in hiding is stepped on or cornered, almost all bites happen to someone trying to catch or kill one. A venomous snake’s bite is its last resort — it’s stingy with venom, because once it’s used up, it has no defense. Apparently for this reason, in 25 to 30 percent of bite cases venom isn’t injected at all. About venom: Venom is a modified saliva made up of different proteins and enzymes and must be injected to be harmful. (If we were to drink venom, it wouldn’t be toxic!) 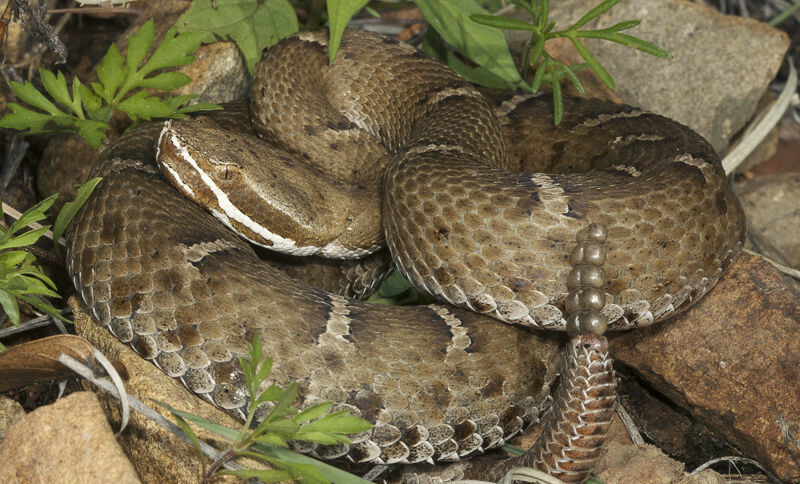 The kind of toxin a venomous snake carries varies with the species and works in one or more of the following ways: As a neurotoxin, which affects the nerve centers and can lead to asphyxiation; a cardiotoxin, which affects muscles and can stop the heart from beating; or a hemotoxin, which affects blood vessels, causing severe bleeding. Don’t put ice on the wound; it can be harmful. Don’t use a tourniquet; it can cause loss of the entire limb. Don’t cut the wound open, as it can cause more harm than good. Call 911 or go immediately to an emergency room. 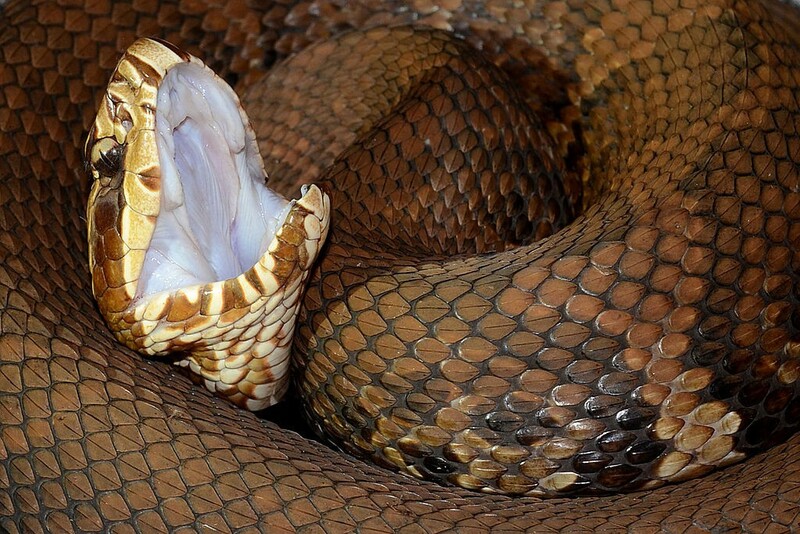 If the victim can’t get to medical care within 30 minutes, wrap a bandage 2 to 4 inches above the bite to slow down the venom. Don’t wrap it so tightly as to cut off blood flow, be able to slip a finger under it. Try placing a suction cup over the bite to help draw venom out of the wound. *The terms venomous and poisonous are often used interchangeably. Venomous is correct. The difference is that venom is injected into a body while poisons enter by other means, such as through the skin or by swallowing.